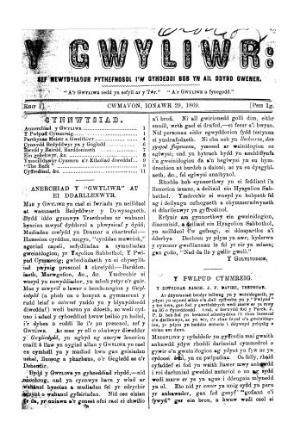 A fortnightly Welsh language newspaper intended for Baptist Sunday schools. The newspaper's main contents were religious news and articles. The newspaper's editors were Benjamin Evans (1816-1866), John Rowlands, Abel Jones Parry (1833-1911) and Hugh Parry (Cefni, 1826-1895). Associated titles: Y Gwyliedydd (1860); Y Gwyliwr (1870).